Robert Frost knew the benefit of accepting the adventure of traveling the road not generally taken, and heeding Frost’s advice led us to a more interesting trip than simply taking the most-traveled tourist route through South Dakota’s Badlands. 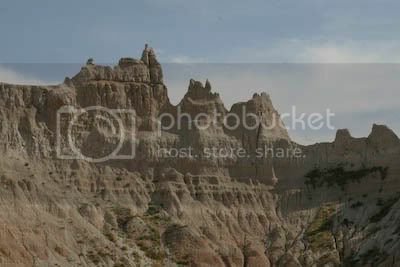 Travelers often enter Badlands National Park by entering the park’s main loop road from one of the exits along Interstate 90, maybe after a quick visit to the kitschy Wall Drug. Given our aversion to using major freeways when we have the time and a choice, we pulled out our trusty South Dakota DeLorme Atlas & Gazetteer and looked for a non-Interstate way into the park from where we were staying in Custer, SD. Our map showed the jagged red arc of Sage Creek Road running off Highway 44, just east of the town of Scenic, and through a major portion of the park to connect onto the main loop road. This route probably doubled our mileage within the park, but we found taking this scenic and well-maintained gravel route to be the best choice when it came to wildlife viewing and photo opportunities for visitors driving through the park. 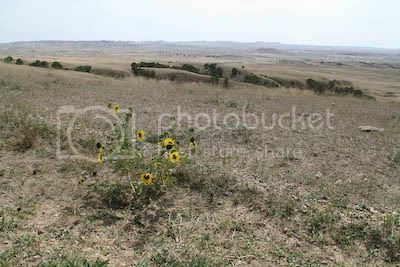 The route began through the beautifully beige plains where herds of bison quietly grazed and a few hearty clumps of black-eyed susans and cactus plants punctuated the plains with a dab of color. Seeing this transitional area, where the plains gave way to the starkest terrain of the Badlands, was the real benefit of taking the sparsely traveled Sage Creek Road into the park. We saw a greater variety of wildlife, undisturbed by tourist traffic, and caught a glimpse of a more varied palette of terrain than the main loop offered. The plains bustled with activity as we traveled through Robert’s Prairie Dog Town, a massive community of the cute and convivial animals. The National Park Service Badlands Visitor Guide even advises tourists taking the main road to take a 10-mile round trip “side trip” off of the loop to visit the prairie dog town. We reluctantly left the prairie dog party and continued along Sage Creek Road to hop onto the main, paved loop through some of the Badlands’ most famously barren, yet beautiful, landscape. Gently muted color becomes more varied, the landscape becomes increasingly arid and wildlife becomes scarcer along the main route. 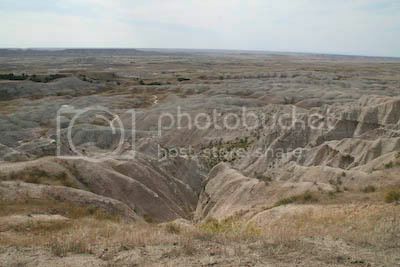 Impressive rock formations and rocky landscape, much of it displaying subtle color variations stratified by time and erosion, offered the more familiar view of what many people think about when they think of the Badlands. Rock formations create a sort of visual history of the area written on the walls in stripes and shades of red, grey, yellow and beige. Each layer represents an epoch, tracing events stretching back 70 million years. The Ben Reifel Visitor Center, named for a former Congressional Representative and Lakota Sioux, is located near the entrance of the main loop road at Interior, SD. The center and the park Web site offer publications, information and programs for visitors interested in learning about the area’s unique geology and wildlife. And so we ended our trip where many visitors start, picking up a couple of postcards and books at the visitor center so we could relive our great day in the Badlands until our next visit there. 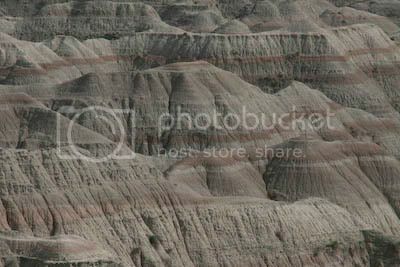 Never thought I'd be interested in the Badlands :) but your writing and photos did the trick. I love taking the road less traveled by. Beautiful description and photos. We always try to find off the beaten path spots when we travel. And these photos are gorgeous. 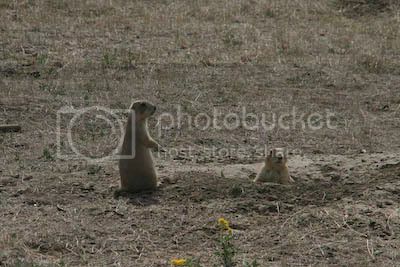 I love the prairie dogs!